Marlins Park opened two years ago, while the first professional baseball game in Wrigley Field (née Weeghman Park) was played on this date in 1914. 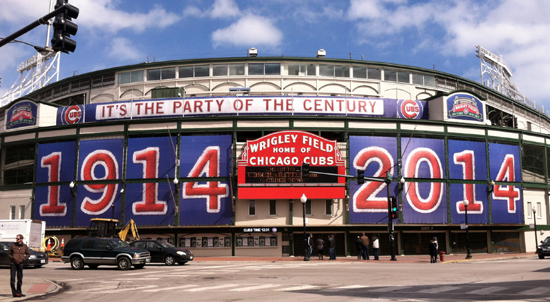 People think of Wrigley Field as a link to our past, and most view longtime owner Philip K. Wrigley as a traditionalist because of his resistance to installing lights. But that’s not completely accurate. Wrigley was ready to begin playing night baseball in 1942, only to donate the lights, towers and cable to the government for the World War II effort the day after Pearl Harbor was bombed on Dec. 7, 1941. The Cubs host the Diamondbacks at 1:20 p.m. CDT.